Merry Christmas, bloggies! 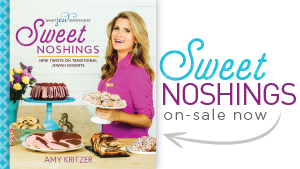 I thought long and hard about a quintessential Jewish recipe to make for you this Christmas. Something festive, seasonal and of course tasty. Then I had it- I knew exactly the meal to make! It’s too perfect, really! But, you will have to wait just a bit longer to enjoy, as I am saving it for next week. Trust me, it is worth the wait! 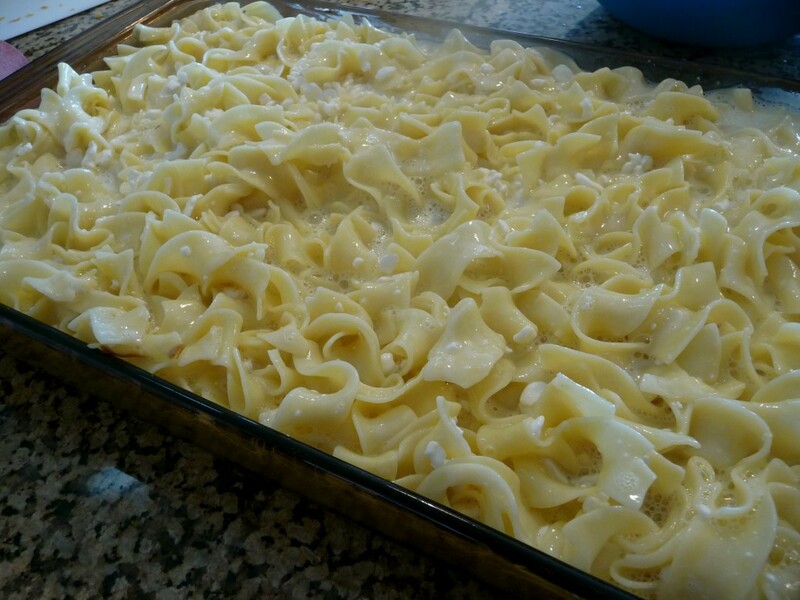 Instead, I bring you noodle kugel. 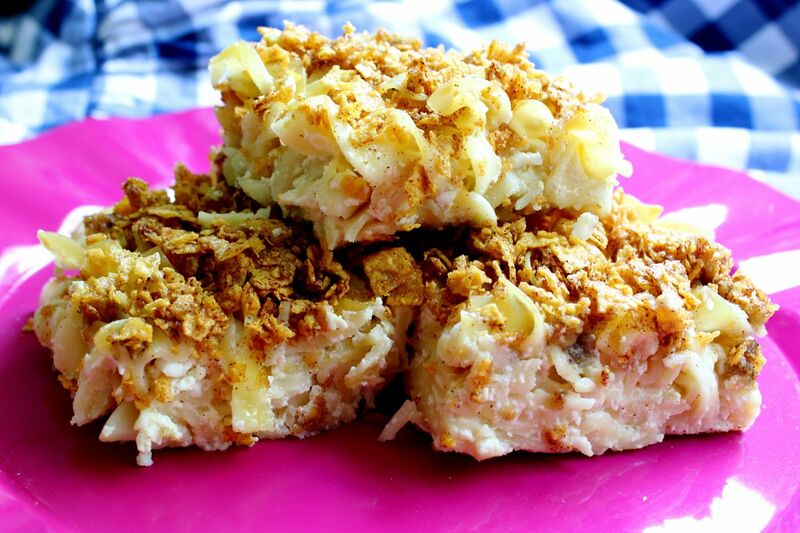 Kugel is traditionally served as a sweet addition to your brunch. As a young Jew, you could make me pretty gosh darn happy by serving up some bagels, lox, a Sunday New York Times and kugel. These days, my brunches typically consist of a plate of bacon (sorry Kosher kids!) and enough mimosas to sedate a donkey. 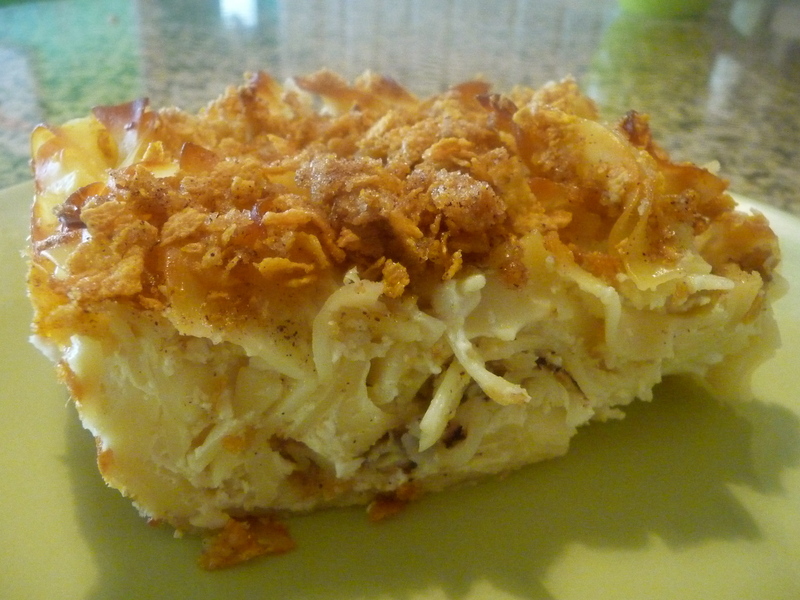 But traditionally, it is all about the kugel. Let’s get cooking! Here is all you need to make your own kugel. If you scroll below you will see three different versions. Don’t stress. 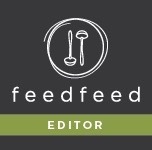 There is an original version, a healthier version, and one with more custard and fewer noodles that is a more custard-y less noodle-y version. I healthified mine up a bit, but included the original measurements below so you can choose your version- a bit o butter, or a whole lotta butter. I trust you will choose wisely. Why yes that is Luke Perry on my kitchen wall. Thank you for noticing. 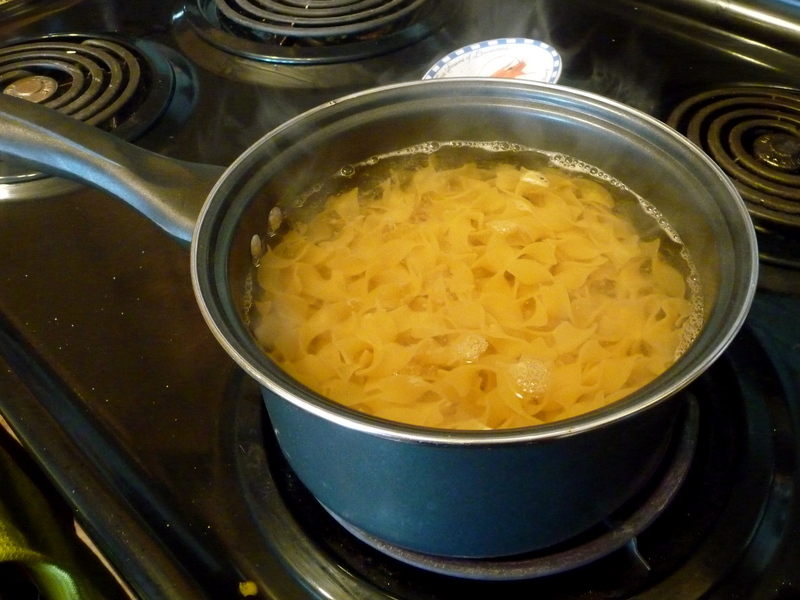 First step, cook noodles according to directions until al dente. 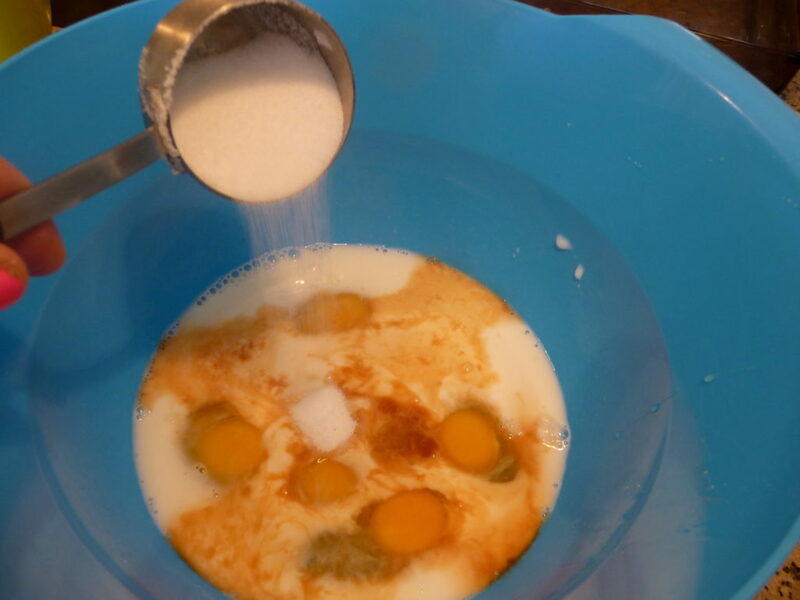 Mix up your milk, eggs, sugar, vanilla and salt. 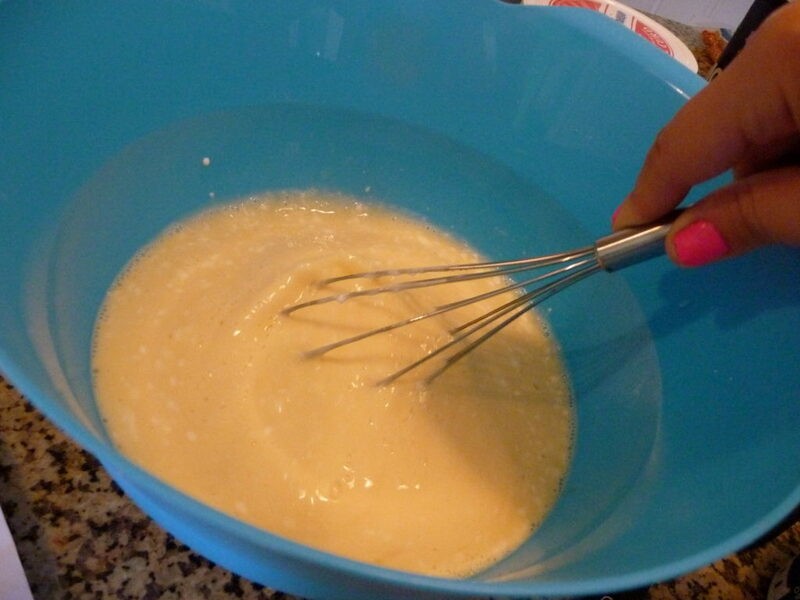 You can use a whisk for mixing, but using a hand mixer will give you frothier base and fluffier kugel. 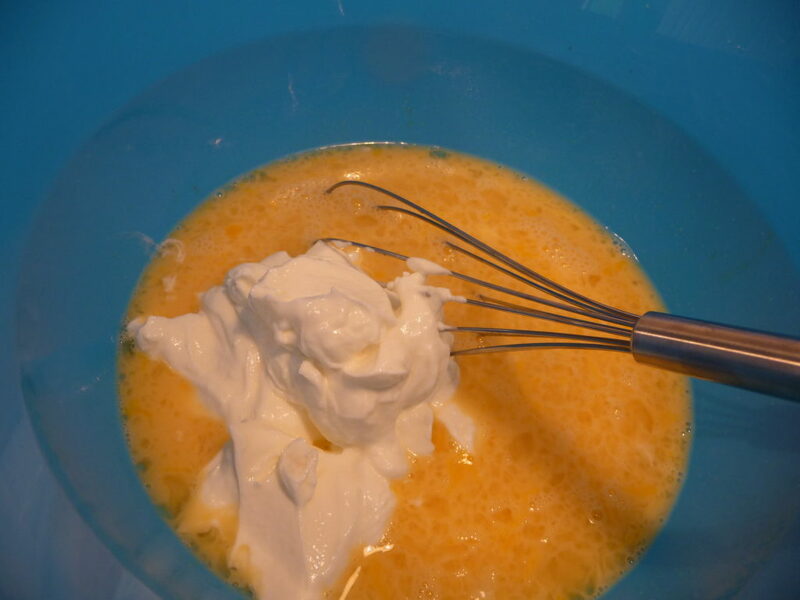 Then, add your sour cream or yogurt. 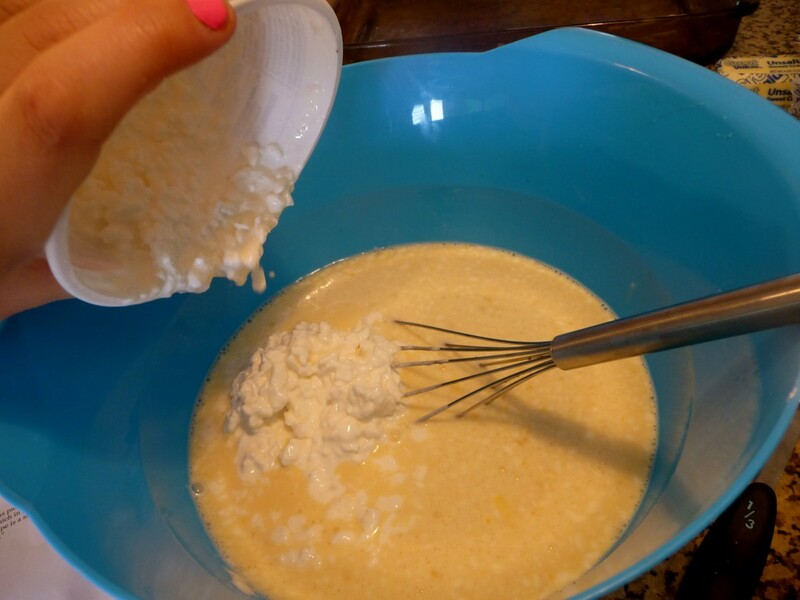 Then, stir in your cottage cheese. After your noodles are cooked, drain well and return to the pot. Then, it’s decision time. 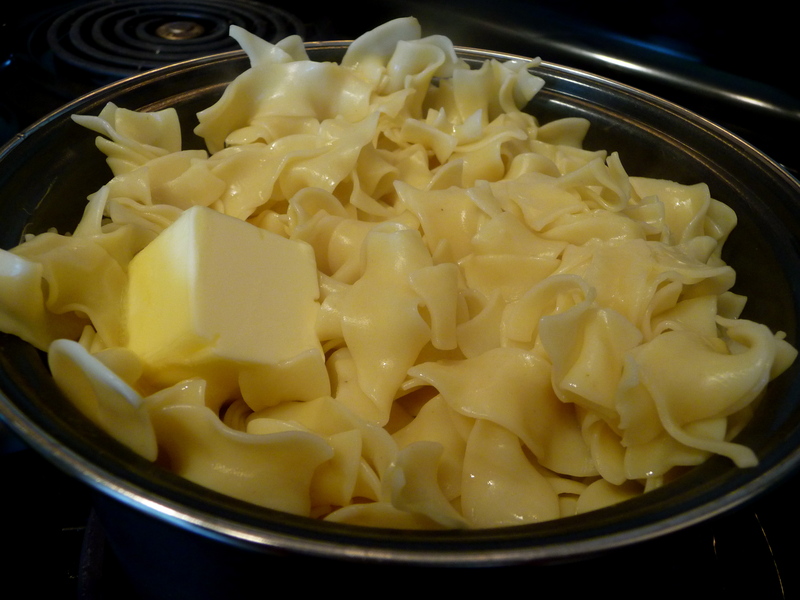 Add a little butter, or a whole lotta butter. Whatever your little heart desires. Buttahhh! 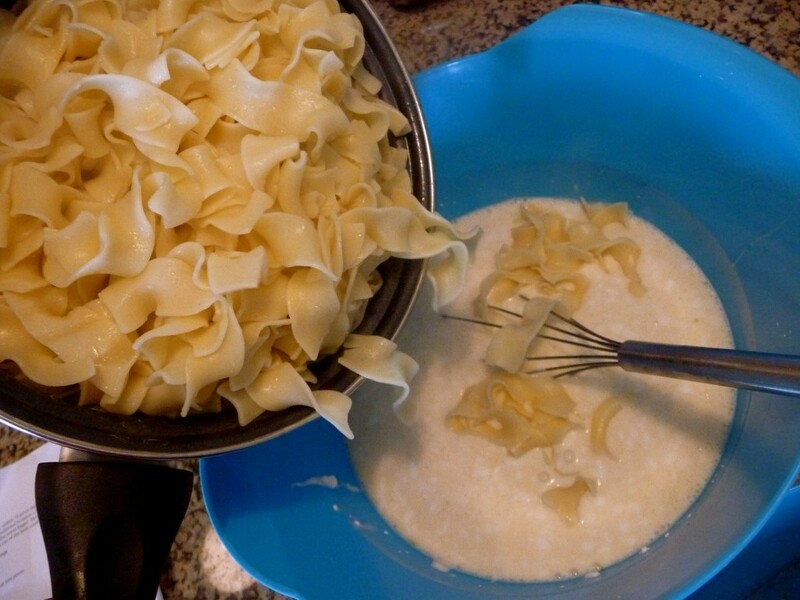 Toss noodles into your mixture, and combine well. This is looking pretty fantastic if I do say so myself! Now time for the good stuff. The sweet, crunchy, delectable topping. First, crush up your cornflakes. 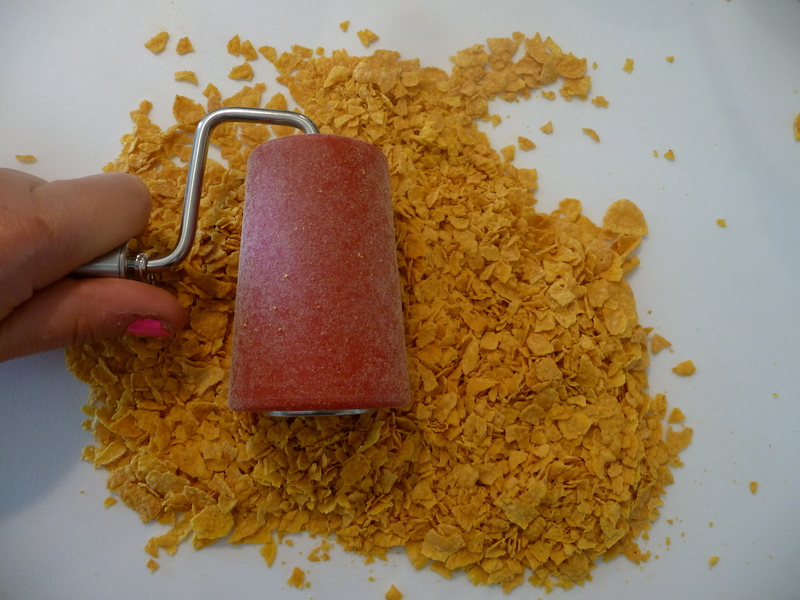 You can use a roller, or crunch in a plastic baggie. I don’t know where I got that utensil, or what the heck it is for, but it does a fine job crushing cereal. 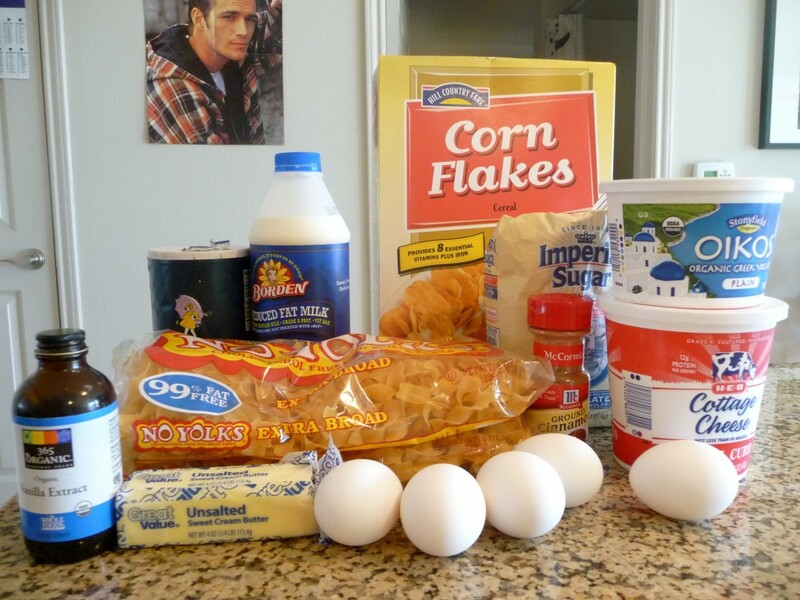 Mix your cornflakes with cinnamon, sugar and butter. I used my hands for this part. Don’t tell anyone. Transfer noodles into a pan, and sprinkle with topping. 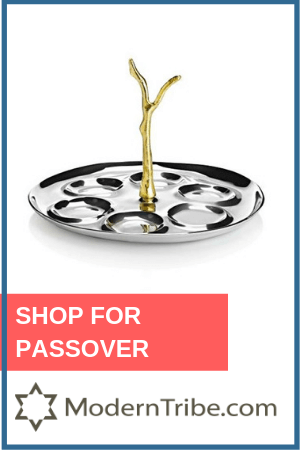 I recommend using a glass pan like this one instead of metal as it gets hotter and bakes the kugel more evenly. Bake for one hour until golden. Brunch is served. You won’t even miss the bacon. 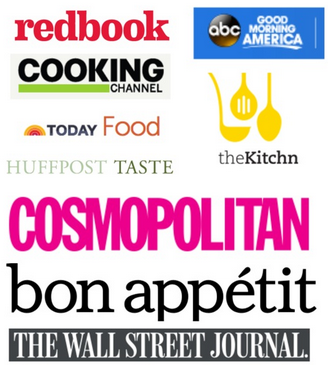 Trust me, your guests won’t stop kvelling. 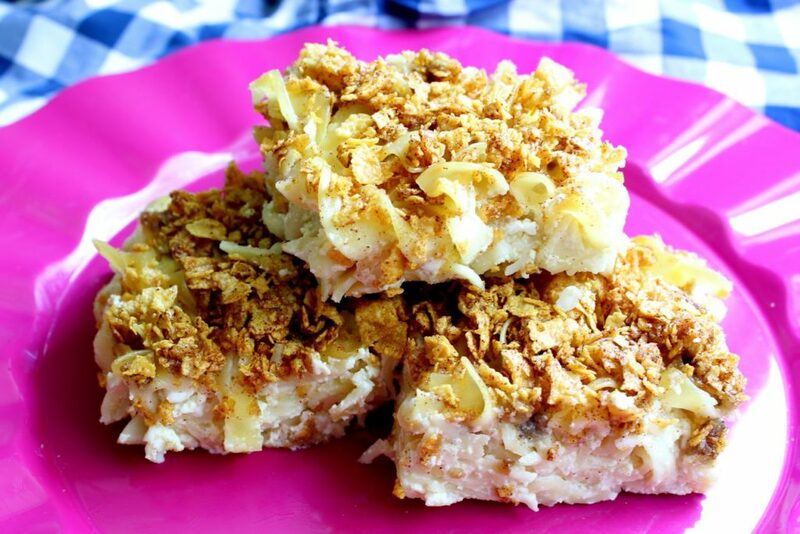 Classic kugel! This version is more noodle-y. Healthier or original versions! Butter a 9x13x2 inch glass or ceramic dish and set aside. Classic kugel! This version is more custard-y. Drain well, then return to the pot. 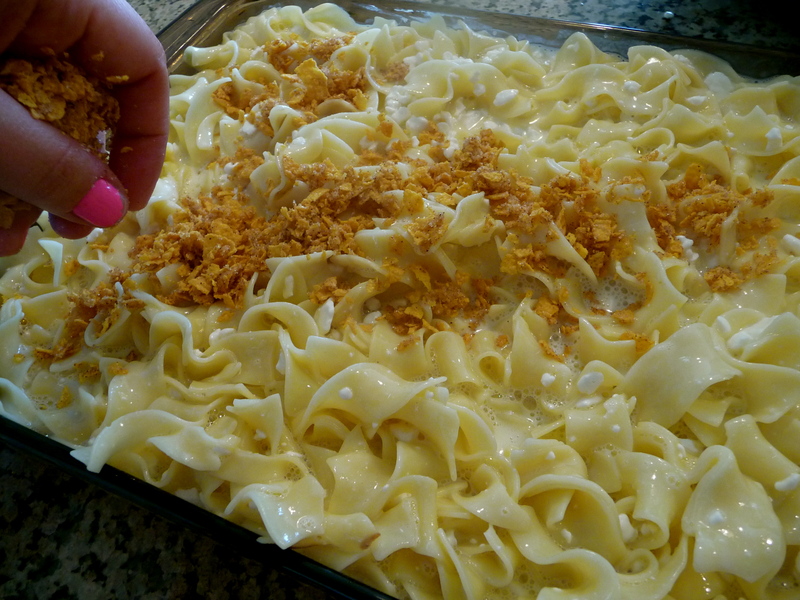 In a separate bowl, mix together all kugel ingredients. 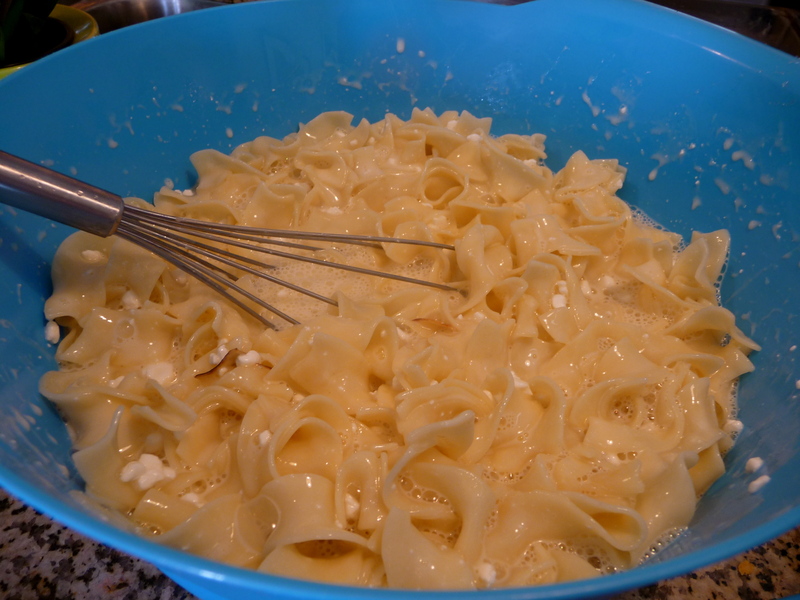 Add to the noodles, and pour into the 9x13 dish. To make the topping, toss together ingredients and sprinkle evenly over noodles. Bake for 45 minutes. Let stand at least 5-10 minutes before serving. Serve warm or at room temperature. YUM!!! Should I be concerned about my arteries, though?? Oh, never mind, nosh away! If you are worried about your arteries, try my healthy version. If not, butter is better! 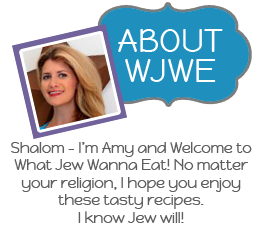 Do you cover the kugel while baking? 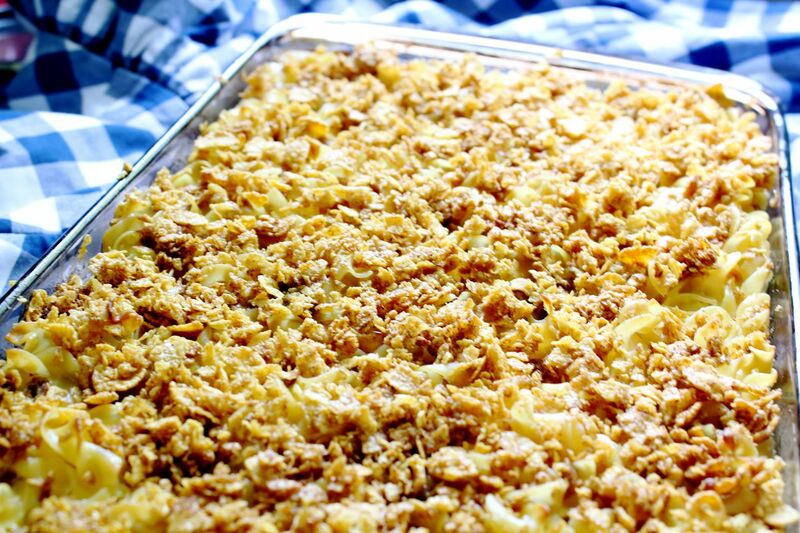 Crazy how most of us are still looking for the perfect kugel recipe, when in fact our mother’s or bubbie’s was the best!! Cannot wait to try this one and tell my cousin Adele that she has met her match!! Nope I cook it uncovered. Let me know how you like it! I made this for my family’s passover seder last night, and everyone loved it! I even asked my mom if she would change anything about it, and she said “no, its perfect”! mom-approved! thanks for the recipe! Awesome!! Glad you liked it. 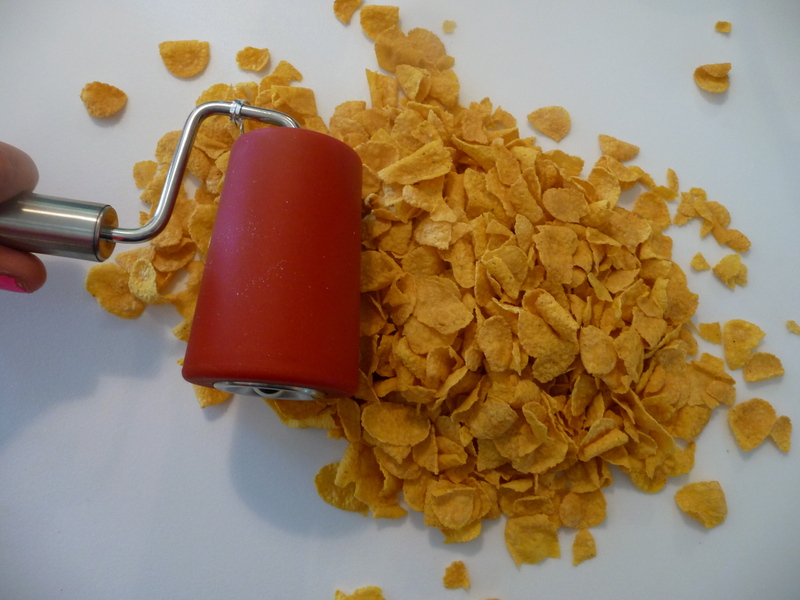 I think the tool you are using to crush cornflakes is a rubber brayer. Used in stamping and block printing, available in most craft stores. Just thought I’d share for those who haven’t figured out where to find your awesome cornflake crusher. HAHA good to know! It was advertised as a pastry roller but that makes more sense! Aw that makes my day! Can’t wait to tell Bubbe. Thank you! This is the same recipe my mom made us! Could I use a metal disposable pan? I want to take it to work for a Potluck. 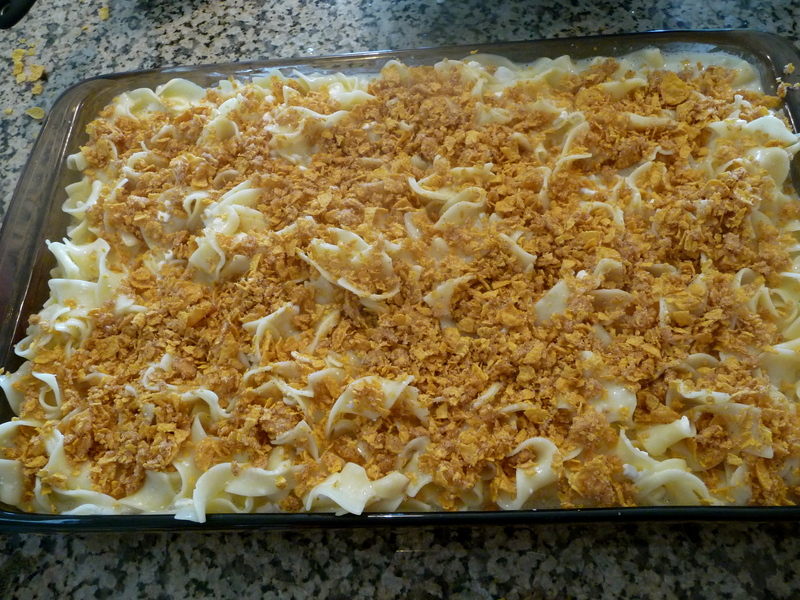 And I don’t have a class or ceramic dish at the moment I’ve made this kugel before and everyone loves it. Hi Rachel- sure, that would work. Thanks! 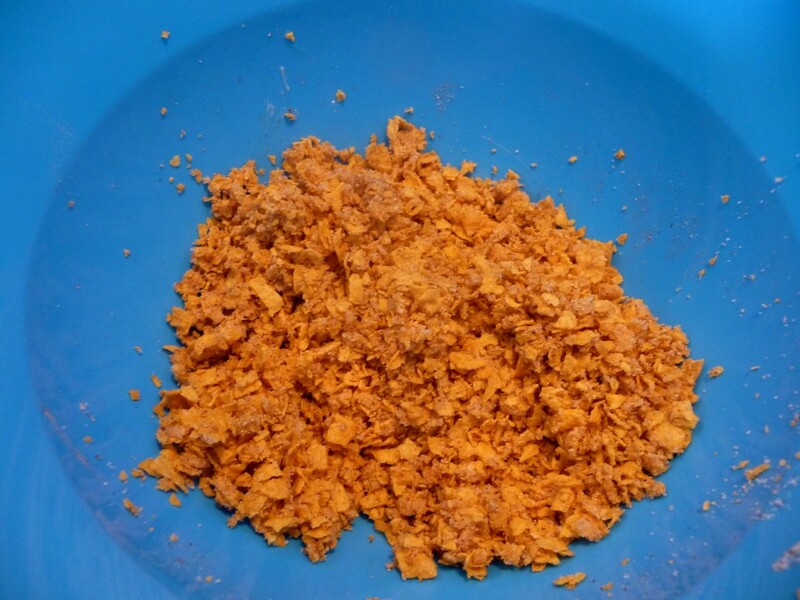 I use crushed Frosted Flakes with melted butter & brown sugar. My family & all others love the topping. If I wanted to make this for Break the Fast a few days from now, are there any adjustments you’d recommend? Can I bake it as stated then keep in the fridge for a few days before reheating? Or leave the topping off til I reheat? I would bake as is and reheat covered, but uncover the last few minutes so the top will crisp up a little. Enjoy!